Conditions: Cloudy, wet from recent rainfall. Temps 60s F with a light touch of humidity. Gear: Hiking shoes, pocket camera. 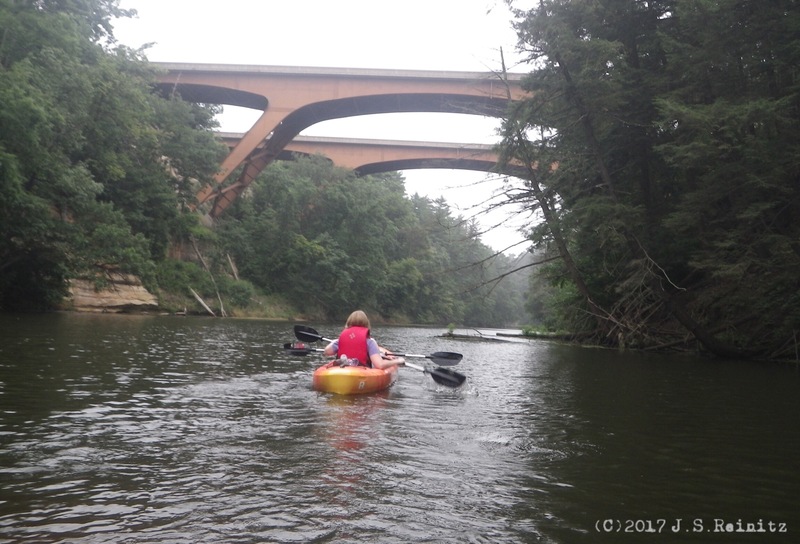 Away from the din of the water parks and go kart tracks and resort hotels that are The Dells, down country roads, past cornfields, tucked away amongst a stand of trees on a lonely Wisconsin hill is the wonder that is Natural Bridge State Park. The site is delightfully remote. No crowds or lines or shops selling $3 bottles of cola. A state park sticker is required to enter, but there is no gate or ranger. Just a short road that leads to an empty parking lot and primitive restrooms. It’s best to memorize the map posted on the trailhead bulletin board. Signage on the trail is sketchy, but that’s part of the appeal. 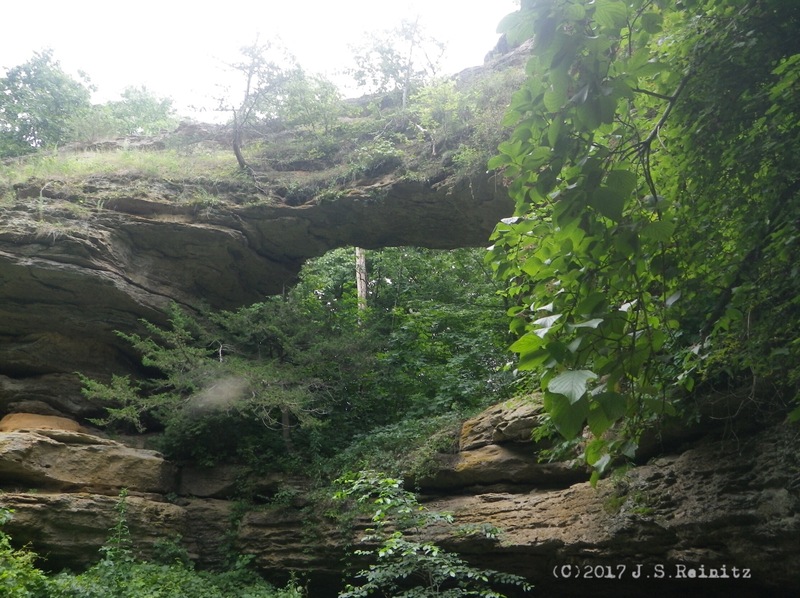 The path is simple and winds through a quarter mile of forest before emptying into a clearing surrounded by sandstone cliffs and the headline feature, the arching bridge, rocky with saplings and other vegetation clinging to its span. 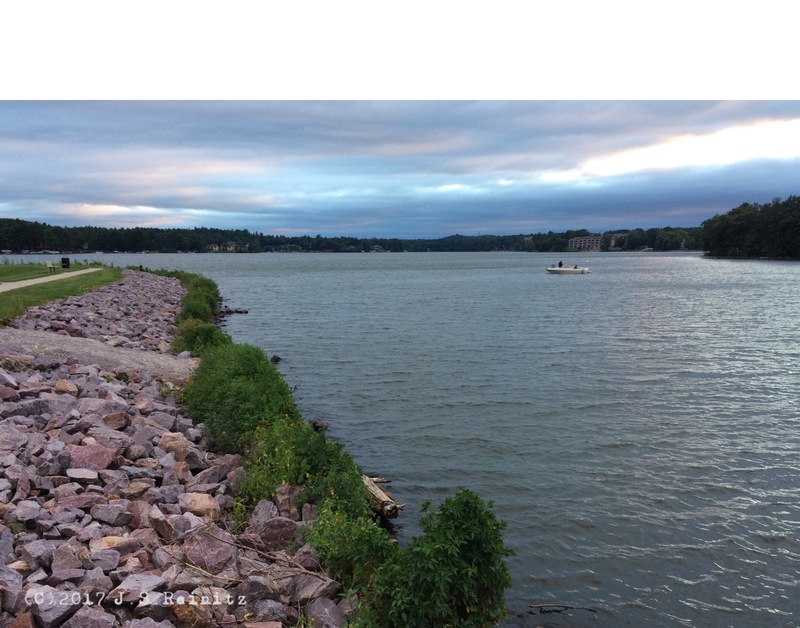 Cloudy sunset on Lake Delton, Wisconsin. Approaching the interstate bridge ove Mirror Lake, Wisconsin. Conditions: Overcast, cloudy, light mist. Temps 60s F. Calm water. Gear: Two single kayaks, one double kayak, paddles, PFDs. If this wasn’t surrounded by water and marsh, I’d be climbing it. Sometimes life’s little obstacles can open new doors. Such was the case with Rocky Arbor State Park in Wisconsin. For years I’ve wanted to visit Witch’s Gulch, a canyon off of the Wisconsin River in The Dells, and this year I put it on our itinerary as a quick morning hike before a day of touristy stuff. But as I sat in our hotel room the night before trying to find directions to the gulch, I discovered the old drive-up, hike-in route was no longer available, and the only way to access it was to book a private boat tour at the cost of $30 per person. We hadn’t budgeted for this, and I’m not too fond of tours that put exploring on a schedule, so I looked around for something similar and came up with Rocky Arbor State Park. 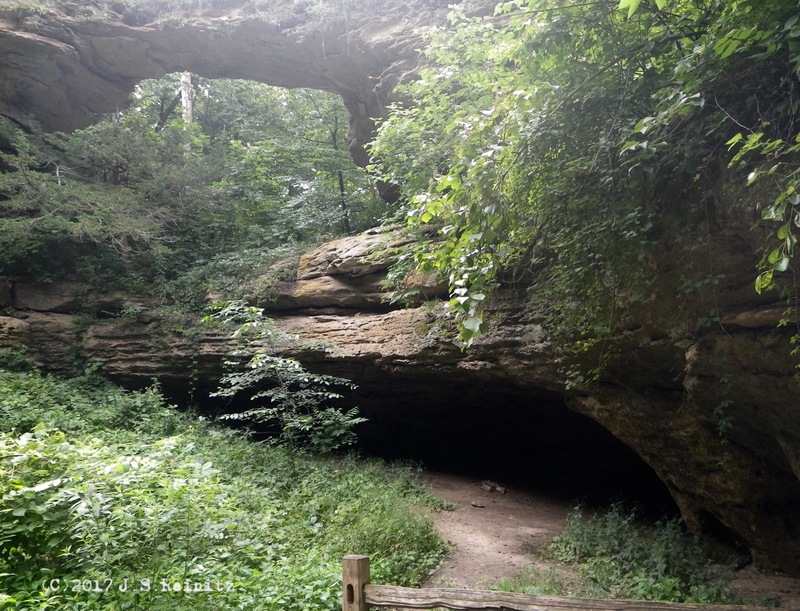 Tucked off of Highway 12, the park is a 500-million-year-old sandstone gorge with a playground/picnic area, a campground and a one-mile hiking trail. The trail skirts a marsh and low bluffs — below the cliffs one way, then a small climb and it loops back around on top of the cliffs. Along the lower trail, we came across an isolated chunk of rock that looked like it had wandered away from the cliffs and waded into the swamp. It sat alone, surrounded by water and mud, trees and saplings growing from it, and I couldn’t resist the urge to climb it. I charted out a course — jump over to the large log to avoid the muck, ascend the north face, only about a dozen feet of challenge, then the going would get easy — but decided the idea reeked of a “hold my beer and watch this” moment that would leave me at the top with no real way down. Imagining the park ranger rescue that would follow, I decided to keep hiking. Admission is $5 per car for an hour, $11 for a full day or free with the purchase of a $28 state parks sticker ($38 for out of staters), which grants entry to other state parks. In the nine years that were its heyday, Fort Atkinson was tasked with keeping the peace for the Ho-Chunk tribe, which had been relocated from Wisconsin to a 40-mile wide plat in northeast Iowa. The neutral ground was originally planned as a buffer between other First Nation tribes, so when the Ho-Chunk (also known as the Winnebago) arrived sometime around 1840, the fort was in charge of protecting the tribe from rivals and keeping its members from backtracking to the cheese state. The fort had 24 buildings inside a wooden stockade and 14 other structures outside its walls. When the army moved out in 1946 to fight the Mexican-American War, a volunteer miltia replaced them. The volunteers helped move the Ho-Chunk on to Minnesota, and the fort was closed in 1849. Over the years, the buildings fell into disrepair as settlers began using the bricks and wood to construct their homes and shops in the town of the same name that sprang up. 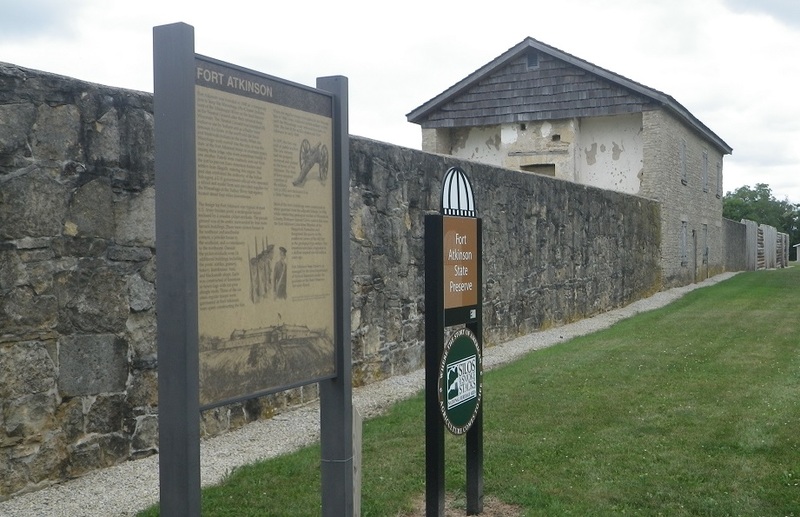 The state of Iowa got what was left of the fort in 1921, and reconstruction started in the late 1950s. Today the fort is a state preserve with a rebuilt stockade wall and a mixture of rebuilt barracks, partial ruins and assorted foundations. Every year, it hosts a pioneer and buckskinner living history rendezvous.